It is understandable that educators and policy-makers are concerned with preparing students for the future. That may explain the popularity of deeply flawed bestsellers, like Tom Friedman’s The World is Flat or Daniel Pink’s A Whole New Mind. As I discussed in my online review of Pink’s book, “The Worst Book of the 21st Century,” the most popular business how-to books were written by people who have accomplished little or nothing in the business world and are not taken seriously by successful corporate leaders. The New York Times interviewed accomplished business leaders and found that they read poetry, philosophy, literature and history. It is the ideals of a strong liberal arts education that fills their lives with pleasure and purpose. Their life preparation avoided the narrow vocational options so many policy leaders propose as the educational path for today’s students. I wrote in my book review, “Ultimately the success of these [pop business] books is based on the authors’ ability to reduce complex concepts to simplistic binary dichotomies or playground rhymes. Such books are filled with numbered rule-based advice with little room for nuance. Issues are either black or white. The principles apply to any situation. Of course, these rules apply to any situation, especially a complex system with as many variables and moving parts as public education. School leaders should be secure in their professional purpose and avoid seeking advice from charlatans, particularly gurus touting an ability to predict the future. So, how can an educational leader keep pace with the world around her, continue to grow and create schools that prepare students for a purposeful life? At the very least, whom should she read, watch or listen to? This sixteen year-old magazine has been around for about as long as the World Wide Web and survived years of hubris followed by the dotcom bubble. Wired covers all aspects of the digital world; including science, emerging technology, politics, culture and commerce. Even their articles about kids, learning and education are thoughtful. Gone are the days of 4 page articles filling 38 pages and the snarky “We are smarter than you” tone of its early days. Wired now has adult supervision and is a terrific way of keeping up with the exciting ways in which our world is changing. Best of all, a twelve month subscription costs as little as $10. In 1984, an intimate annual conference was held in Monterey, California. The TED Conference (Technology, Entertainment, Design) was a place where scientists, artists, world leaders and cultural icons come together and share powerful ideas. In TED’s early days, each attendee was also a presenter. The rule that every presentation needs to be approximately 15-18 minutes long allows for as many as 50 presentations over four days. There is only one session at a time. TED is expensive and exclusive. Therefore, your chances of attending are very low. However, TED has begun distributing high-quality video podcasts of presentations recorded throughout its history. You can subscribe to the series via RSS and watch them on your computer or iPod whenever you need a dose of inspiration. TED Talks by Sir Ken Robinson, Al Gore, Dave Eggers and Majora Carter are fantastic. Once you get done watching Bill Clinton or Bono you might want to check out Amy Smith who has dedicated her life to creating sustainable charcoal or see Neil Gershenfeld describe how you may soon email a bicycle. It is the very eclecticism of TED that makes it such a fantastic event. Experts who commit their lives to doing one thing, even a small thing, extremely well, inspire me. Pop!Tech is similar to TED and is held each Fall in Camden, Maine. Each year, Pop!Tech is organized around a particular theme. Pop!Tech has also begun making video podcasts of its presentations available for free download. Bill Clinton reminded his audience at last year’s NSBA Conference that every problem in education has been solved somewhere. The recent republication of Angelo Patri’s book, A Schoolmaster of the Great City: A Progressive Education Pioneer’s Vision for Urban Schools (New Press, 2007), is a must-read! Patri emigrated to the United States from Italy in the late 19th Century and went on to become a teacher and principal in the New York City Public Schools. This incredible book, first published in 1917, describes the challenges facing schools today and offers compelling solutions. Patri knew everything school leaders need to know today and shares it in one incredibly readable paperback. Play an episode of CNBC’s Mad Money, Good Eats from the Food Network or even The Apprentice and ask teachers to identify lessons for improving their practice. Join a club. Rekindle a hobby. Attend a lecture series. Explore your community’s cultural offerings. Work with kids in a non-school setting. Read a good book. Enriching your own life is sure to make you a better educator. Before increasing your technology investment, it may be prudent to pause and review your expectations. What you and your colleagues believe about learning and the aims of education drives the success or failure of classroom computing. This even has implications for what you purchase. I suggest that it is the combination of a vision deficit, meager goals and technological ignorance that limits the educational potential of computers. Vision deficit, meager goals and technological ignorance limits the educational potential of computers. Tom Snyder, a former private school teacher and musician, started an educational software company in the 1980s. He observed the classroom landscape and recognized that many classrooms had only one microcomputer. He responded to this market reality by designing software for the “one computer classroom.” In his view, the classroom is a stage, the teacher is the performer, and the computer is a prop. What was a perfectly reasonable marketing strategy 20 years ago has become an ideological position still held by some educators. The different perspectives of Bork, Snyder and Papert represent fundamental issues of agency. Who has the power and is at the center of the educational process? Bork views the computer for the system, Snyde, for the teacher, and Papert for the learner. You and your colleagues should consider where you stand. It may also be worthwhile reflecting on the technology you own or are considering. Where does each tool or practice fit within this paradigm? While it’s possible to “stand” between Bork, Snyder or Papert without standing behind one of them, assuming a stance increases clarity and makes implementation more consistent. Such consistency increases the efficacy of your district’s tech use. The epistemological relativism of efforts like the ISTE Standards may diminish their impact. An equivalent embrace of Bork, Snyder and Papert sends a confusing counterproductive message to teachers. If you believe that the computer’s optimum role is to deliver content, monitor progress and aggregate data, then you need to invest in large-scale teaching systems with publisher-created curricula. The needs and desires of centralized administrators are favored in such a scenario. Little professional development is necessary for teachers, since the computer lab may be supervised by a paraprofessional. If your goal is to have teachers present technology-enhanced lectures or use the computer to prepare worksheets, tests or parent newsletters, then professional development may focus on helping teachers master the mechanics of using computers for instruction or personal productivity. Educators interested in having students create, construct and collaborate with computers may invest in open-ended software and personal laptops enabling 24/7 learning. Teacher professional development may have more to do with principles of project-based learning or constructivism than on computer skills. Even 1:1 computing is shaped by your objectives. If your goal is for fifth-graders to develop office skills or to use their laptops to take notes in class, the educational impact may be modest and probably in the Snyder camp. You may only need low-cost word processing devices. I got excited about computing 30 years ago because I was able to feel creative and intellectually powerful. I aspire to more bang for the computer buck by creating contexts in which students use computers to learn and create in ways that enhance their humanity and challenge preconceived notions of children as inadequate thinkers. While most educational computing is relegated to the language arts, I help inspire action in the arts and sciences. My students require full-featured computers capable of being the means for serendipitous discoveries. The difference is whether the computer is used to sustain routine teaching practice or transform learning. I’ve written a white paper on evaluating a computer activity’s potential for transformative learning, Towards the Construction of a Language for Describing the Potential of Educational Computing Activities, that may be downloaded from www.stager.org/potential. I’m taking a class of Pepperdine University doctoral students to Costa Rica for my Global Perspectives on Learning Technologies course. While there, we’ll be going on a school visit and have meetings at the Omar Dengo Foundation, the NGO responsible for supporting Costa Rica’s 25-year leadership in constructionism and computing. I haven’t been in Costa Rica since 1991. It’s always nice to be in a country where they understand and respect Seymour Papert’s work. I am really looking forward to it! The Constructivist Consortium is hosting its 5th annual Constructivist Celebration in Philadelphia, June 26, 2011 – the day before the ISTE Conference begins. Join colleagues from around the world in a day-long minds-on celebration of creativity, computers and constructivist learning. The Constructivist Celebration features project-based activities geared towards K-12 educators, administrators & teacher educators. This year’s theme is HARD FUN! Educators completing a difficult year deserve some HARD FUN! The day ends with a conversation with Will Richardson. After a kickoff keynote by Dr. Gary Stager, participants will select challenges using the open-ended creativity software provided by Constructivist Consortium members, including LCSI, Tech4Learning and Inspiration. In addition to your mind and spirit, you body will be nourished by continental breakfast, hot lunch and afternoon snacks courtesy of our Maggiano’s Little Italy! Last year’s participants could not stop raving about the food! Representatives of Generation YES, LCSI, SchoolKiT and Tech4Learning will lead challenges and support project development. The day ends with time for project sharing and reflection followed by a conversation, “Digging Deeper,” with Will Richardson and Gary Stager. I am most grateful to Will for his generosity and willingness to participate! Best of all, the entire day – software, an endles feast and a spa-day for the mind costs only $60! Register today! Past Constructivist Celebrations have been extremely popular and space is limited. Constructing Modern Knowledge 2011 (July 11-14, 2011) guest speaker and MIT Media Lab reception host, Dr. Mitchel Resnick, was recently interviewed for the Google Science Fair. Register today for the professional learning event of the year! In addition to the keynote addresses, presentation topics and workshops offered here (including the three popular keynotes listed below), I have created new hands-on minds-on workshops and presentations. Join colleagues for a day of hard fun and problem solving where computing meets tinkering and performance. A secret yet timeless curricular theme will be unveiled Iron Chef-style. Participants will work with a variety of software, hardware and found materials in four domains (virtual, tactile, audio and video) to express the theme in a personal fashion. The day’s intensity will lead to impressive gains in skill development and a greater understanding of effective project-based learning. Computer programming, filmmaking, animation, audio production, robotics and engineering are all on the menu. Bring a laptop and camera or video camera We’ll supply the rest. Invention is the mother of learning! For information about booking Gary Stager for a conference keynote, school workshop or consulting services, email here. Gary’s bio may be found here. There may be no greater gap between a discipline and the teaching done in its name than when the beauty, power and mystery of mathematics becomes math instruction. One can only begin to address the systemic challenges of math education by understanding the nature of mathematics. Nearly 100 years of efforts to increase achievement with unchanged curricular content continues to fail spectacularly; yet, we do not change course. This workshops moves beyond the goal of making math instruction engaging to providing educators with authentic mathematical thinking experiences. Such experiences acknowledge the role computers play in mathematics and society’s increasing demand for computational thinking. Project-based approaches with mathematics at the center of the activity will be explored. Traditional concepts such as numeracy, geometry, probability and graphing will be investigated in addition to exciting new branches of mathematics rarely found in the primary grades. This workshop is designed for teachers of grades 3-8. It may also be offered as an ongoing course with a greater emphasis on curriculum development and action research. The increasing ubiquity of computational and communications technology in classrooms creates challenges and opportunities suggesting a need for a refresher course in learner-centered education. Project-based learning, classroom centers, interdisciplinary curricula and collaboration supercharge the power of computers as intellectual laboratories and vehicles for self-expression. Classroom computing affords schools an additional opportunity to recalibrate values and improve teaching practices on behalf of learners. This hands-on minds-on workshop helps expand your vision of how computers may be used in knowledge construction while exploring pedagogical strategies for creating rich computing experiences that amplify the potential of each learner. Mini activities model sound project-based learning principles and connect various disciplines across multiple grade levels. Modern schools face several challenges; among them are the questions at the heart of this workshop. Once teachers are finally convinced to use computers as instruments for learning, do they have creative project ideas and do they possess the pedagogical skills necessary for success? This minds-on hands-on workshop will feature mini-projects designed to nurture sophisticated inquiry, computational thinking and artistic expression across disciplines and grade levels. The presenter will also discuss pedagogical strategies for using computers in an effective fashion as intellectual laboratories and vehicles for self-expression. These strategies illuminate principles of sound project-based learning and honor the individual learning styles, talents, curiosity and intensity of each student. 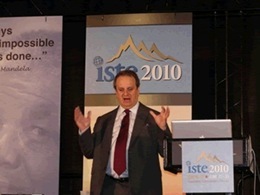 Dr. Gary Stager has thirty years of experience helping educators maximize the potential of computers and create productive contexts for learning on six continents. He led professional development in the world’s first laptop schools, created one of the first online Masters degree programs and was recently recognized by Tech & Learning Magazine as one of today’s 30 most influential educators. When we say, “We’re preparing kids for the future”, it might be handy to review what we already know about creating productive contexts for learning and give serious consideration to the habits of mind demonstrated by today’s creative class. This workshop engages participants in minds-on activities requiring reflective practice and visioning exercises that use provocative video clips to explore the learning lessons of experts. Hands-on computing activities are added for workshops longer than 90 minutes in duration. There is quite a bit of controversy surrounding young children’s computer use and not just by the folks who think modernity is turning children into brainwashed zombies. The edtech community has a lot to answer for in its “hand-me-down” approach to computers in the lower primary grades and the embrace of software that may be at odds with the pedagogical practice or educational philosophy of a school. This keynote address or hands-on workshop will explore ways in which computers, especially personal laptop computers, may be used to enhance the most childlike aspects of learning, amplify human potential and celebrate creativity. We will situate computer use in the theories of Dewey, Piaget, Papert, Montessori & Malaguzzi while arguing that young children need more computational power than older students. Playful examples of computational thinking among primary school students will be shared. Award-winning educator, Dr. Gary Stager, will explore everything a modern educator needs to know about learning and school reform in less than an hour! School improvement is dependent on a recognition that we each “stand on the shoulders of giants” and can learn from the lessons of others. Successful 21st Century educators not only possess practical knowledge about the change process and technology integration, but a working understanding of the learning theories that propel those interventions in a way that benefits children and teachers. The rollicking presentation is intended to inspire, inform and entertain! The theory presented will be connected to contemporary best-practices and the personal experiences of the presenters. Follow- up resources, including Web links, videos, articles and suggested reading will be provided. Educators, including tech coordinators and CTOs concerned with advancing educational practice should situate their professional actions on not only best practices, but on theoretical foundations as well. “Standing on the shoulders of giants not only informs decisions that benefit the educational enterprise, but increases the potential for successful interventions. The presenters have observed a shocking level of “educational literacy” among their colleagues in the edtech sector and have decided to do something about the situation in a high-spirited witty fashion. Every person concerned with education would benefit from a refresher course in the powerful ideas and lessons learned from great thinkers and school reform efforts of the past and present. This one-of-a-kind session is deigned to light a spark under attendees to sustain their high-tech innovations by building upon a solid theoretical foundation. Follow-up resources, including Web links, videos, articles and suggested reading will be provided. Eavesdrop as two edtech pioneers and old friends regale each other with hilarious and profound tales of computing, magic, chemistry, history and suspended adolescence. Each mischief maker will have their laptop connected to a giant screen so they may spontaneously share interesting props, tell stories and engage in multimedia mischief-making. Be as amazed, inspired and entertained as Roger and Gary are whenever they collide. Hilarity will ensue! This keynote promises to be like no other! There’s chatter from time-to-time within the edtech community about the lack of women in prominent roles. Yet, some of the most important pioneers in the field are ignored, overlooked or marginalized by the very same educators seeking representation and role models. If Seymour Papert is the “father of educational computing,” then Dr. Cynthia Solomon is its mother. Cynthia was one of the three primary inventors of the Logo programming language for children and she introduced many of the metaphors used to teach programming to children. She is the author of one of the field’s seminal books, Computer Environments for Children: A Reflection on Theories of Learning and Education. How many of you have read this book first published in 1986? Nearly 50 years ago, armed with a history degree from Harvard, Cynthia took a job as Dr. Marvin Minsky’s secretary because she wanted to learn how to program computers at a time when that wasn’t an option for young women. A few years later, she, Wally Feurzig & Seymour Papert created Logo and started the educational computing revolution. Watch the recent interview in which Cynthia & Wally recount the birth of Logo. Cynthia Solomon is also the co-author of Designing Multimedia Environments for Children (with Allison Druin) and Logoworks: Challenging Programs in Logo by Cynthia Solomon, Margaret Minsky and Brian Harvey. She most recently put the full text of Computer Environments for Children: A Reflection on Theories of Learning and Education and Logoworks… on the Web for free. In 1985, I traveled to MIT for the first time to attend the Logo ’85 international conference. I was 22 years old and had no academic credentials. Memory suggests that the instant I stepped out of my cab, Cynthia Solomon and a handful of other great scholars and educators said, “Hey kid, come to dinner with us.” I’ve been lucky enough to have Cynthia Solomon as a friend, colleague and mentor ever since. My annual summer institute, Constructing Modern Knowledge, would be unimaginable without Cynthia on the faculty. She returns to CMK 2011 this July 11-14th for the fourth time in four years. There is still room for additional registrants at this year’s Constructing Modern Knowledge institute! Register today! I created Constructing Modern Knowledge (CMK) four years ago as a labor of love. I was growing increasingly concerned that educators lacked the time necessary to develop fluency with the software environments they embrace for students and may not have a deep enough understanding of learning theory or progressive educational practices to situate classroom computer use in a meaningful context. I also wanted to help leaders in the progressive education community recognize that computers are not the enemy of creativity and intellectual development. It is enormously gratifying to see CMK become more successful each year. It is equally mind-blowing to think that Jonathan Kozol, Deborah Meier, Alfie Kohn, Lella Gandini, Derrick Pitts, Bob Tinker, James Loewen, Mitchel Resnick, Peter Reynolds and Marvin Minsky would agree to participate in my intimate summer institute. The greatest joy of my life is creating opportunities for educators to meet and spend time with their heroes. CMK does just that. The CMK faculty of Cynthia Solomon, Brian Silverman, Sylvia Martinez & John Stetson are the best in the world. Cynthia and Brian are responsible for many of the open-ended software tools and pedagogical approaches constructivist educators employ when they teach with computers. Sylvia is an expert software developer, curriculum designer and student empowerment advocate. John Stetson is quite simply the best teacher I have ever met. They work together and with CMK participants like a well-oiled machine. Registrations for CMK 2011 – July 11-14, 2011 are terrific!. In order to maintain the quality of educational experience I demand, I have expanded the real estate for our learning environment and added an additional expert educator to serve on our faculty. We became great friends and have worked together in numerous capacities ever since. Jeff’s breadth and depth of knowledge is remarkable – bordering on maddening. He is a briilliant educator, lifelong learner and raconteur. The skills he has developed over thirty years on Australian public radio will make an important contribution to CMK participants’ interactions with our amazing guest speakers. The following is a little more biographical information on Jeff Richardson, just one more reason why you should register for Constructing Modern Knowledge 2011! Jeff Richardson is the Director of Student Services for Trinity College at the University of Melbourne. For decades, Jeff was a senior lecturer in education at Monash University where he was a pioneer in online learning, even before the graphical Web. As a result, Mr. Richardson taught a generation of educators across Australia to use computers in a constructionist fashion. Jeff was also a primary teacher and taught at RMIT (Royal Melbourne Institute of Technology) as well. He was the Australian editor for The Logo Exchange. When not teaching or supporting students, Jeff Richardson is one of Australia’s most enduring and popular radio personalities. Jeff is host and a founder of The Coodabeen Champions, a comedy troupe with multiple shows on the Australian Broadcasting Corporation (ABC), now celebrating its 30th anniversary – the same number of years Johnny Carson hosted The Tonight Show. Jeff is also the substitute co-host for ABC Breakfast Radio in Melbourne. He also sang the Coodabeens’ hit song, That’s the Thing About Football, before more than 100,000 at an Aussie Rules Football Grand Final (think Superbowl). The Coodabeens have enjoyed best-selling books, songs and albums. Their motto (below) oddly captures the spirit of Constructing Modern Knowledge.